When I first started out freelancing, I had just come out of an evening life drawing class where I was introduced to the medium of soft pastels, and I spent a lot of time in the early years of my freelance career marketing this particular style. It became quite difficult for many reasons; shipping the fragile artwork, which was apt to smudge no matter how much fixative you sprayed on it (and the fixative often would change the colors); it would frequently necessitate working much larger than the finished print size due to the nature of the materials, and worst of all for health reasons, the dust generated by the medium would make breathing in my office a complete nightmare. I mostly gave up working in pastels around the mid-90s. But I’ve occasionally dabbled in the digital version from time to time, and I had another opportunity this month for US Catholic magazine. This was a scene of a funeral, and the original is quite a bit bigger than the sample shown here, reaching across the bottom of a two page spread. It was a nice change of pace to get a chance to dabble in this medium again. Also, for the same client, I had a small spot of a parrot, for which I used my more routine scratchboard style, but a bit more colorful and stylized than usual. A new client Company magazine contacted me around this time, as they had seen a number of saint portraits I had been doing over the past few months for America magazine. These have been rather tricky, as there usually isn’t much in the way of reference material for these people. This assignment was no different, I had to base this portrait on a grainy little image taken from an old book engraving. 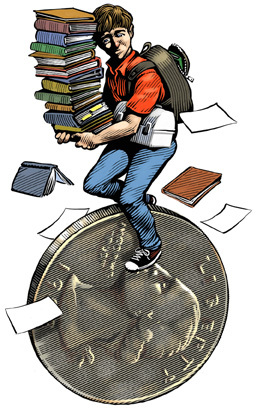 Another assignment for the Chronicle of Higher Education came in during the latter half of the month, bringing me a sigh of relief after the mess of the last assignment. This one was about students and financial difficulties faced outside of the regular tuition costs, books, room and board, etc. I liked how the coin turned out on this one. A technique to keep in mind next time the ‘coin’ assignment comes along. Another in the long running series of spots for my ‘health care’ column for the Wall Street Journal. This one concerned the purported health benefits to be found in fresh baked cookies. A claim I’m sure a lot of people, myself included wish were true (I don’t remember if it ended up being bonafide or not – I frequently don’t receive the entire article when I get these assignments, sometimes just a one or two sentence topic). 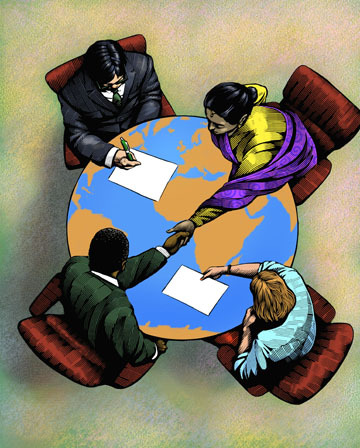 Another project that came through during this period was a full page illustration for the American Bar Association, this one being about international agreements and contracts. Needed to do some photo reference for this odd angle, myself and my wife posing for all the characters. I liked how the background color turned out on this one. 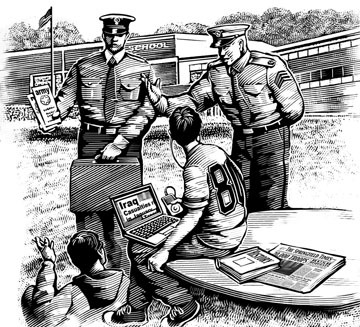 A black and white same day illustration for Newsday concerned armed forces recruiters and their difficulties in talking to teens in high schools who are a bit more savvy about the news than their counterparts of years ago. One thing I rarely like to do in an illustration, is include text, either on headlines in newspapers, or on buildings or as labels on items in the drawing, as a way of ‘explaining the concept’. It always seems like a cop-out, but sometimes it just can’t be avoided. This one, unfortunately, had it going in spades (note the ‘history’ textbook, the building labeled ‘school’, the ‘army’ brochure, the headlines on the laptop and newspaper. 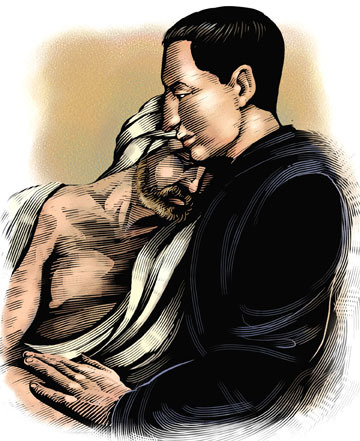 During the latter part of the month, I also received a few illustrations from a relatively new client who I had done a few tentative jobs for earlier the previous year. Niche Media, who publishes a number of regional periodicals across the country (Boston Common, Gotham, a Los Angeles magazine, the name of which escapes me), asked me to do a pair of spots for a couple columns in a couple different magazines. 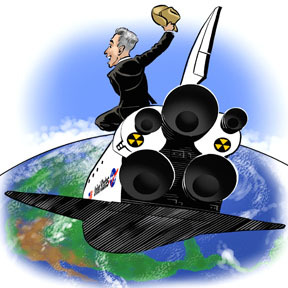 The first one was a humorous spot for a syndicated conservative columnist regarding the danger of nuclear fuel on the space shuttle, doing a takeoff on the famous final scene from ‘Doctor Strangelove’. 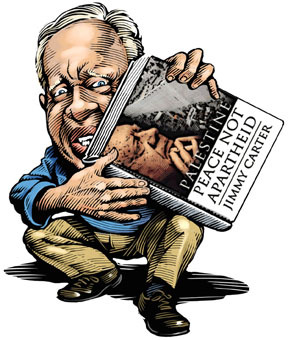 The other piece was about former President Carter and his new book, although I have to admit I don’t quite remember the slant of the article. I just remember finding Carter a little difficult to capture as a caricature subject (I remember it being a problem back when he was in office).